KEDVII 1901 issue 1d, 1/-. KGV 1926 issue, 1d, 2d, 3d, 6d. KEDVII 1901 issue 1d R4, 1/- R4. KGV 1926 issue 1d R3, 2d R3, 3d R3, 6d R3. 1902 issue 3d, 6d, 1/-, 2/6d, 5/-. 1915 issue 1d, 3d, 6/- 1/-. 1927 numeral issue 1d, 3d, 5d, 6d, 1/-, 2/6d, 5/-. 1902 issue 3d R4, 6d R4, 1/- R3, 2/6d R4, 5/- R4. 1915 issue 1d R4, 3d R4, 6d R4, 1/- R4. 1919 roulette issue 3d R4. 1927 numeral issue 1d R4, 3d R4, 5d R4, 6d R4, 1/- R4, 2/6d R4, 5/- R4. Background: *David Brown was born in Scotland in 1839 and trained in the soft-goods business. In 1862 his elder brother Thomas, who had founded a drapery in Glasgow, sent David to start a branch of the business in Brisbane. This business was named D L Brown and Co.. Despite major losses in the 1863 and 1893 floods and a devastating fire in 1888 the Browns built up a large and successful distribution business. They increased their range of imports and expanded their distribution by purchasing ships to deliver to the Tweed River district and the South Sea Islands. D L Brown and Co had a private wharf at the main warehouse in Eagle Street and in 1877 they purchased wharfage facilities in Short Street which it expanded into a major overseas terminal. In 1888 the Eagle Street warehouse was totally destroyed but a new ornate building was built to replace it. In the late 1880s Thomas sent out his own two sons, John and Thomas (jnr) to Brisbane and in 1889 D L. Brown & Co. was restructured as a public company under the name of Thomas Brown & Sons and David retired leaving the management to his nephews. Although the head office was later located in London, the company continued to grow in Queensland establishing a branch in Darwin, acquiring Beenleigh rum distilleries in 1918, then later taking over clothing manufacturing and food processing firms, and a retail supermarket chain. David died in June 1907 aged 68. Thomas Brown (snr) made several visits to Queensland, the first in 1882, and he died in London in April 1912 aged 80. 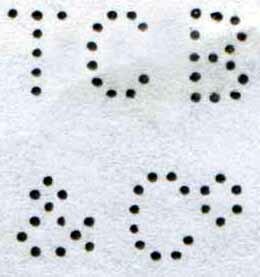 Device: The records show Thomas Brown and Sons appled for and received permission to use a perforating device in October 1908. This application was most likely for the use of a TBS device that predates the use of TBS.a and TBS.b. This single head device, (shown below) produces a pattern similar in scale to TBS.b but it is characterised by thick pins and a flat topped B. 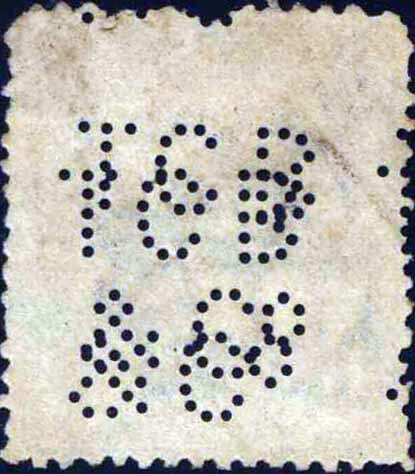 This pattern above has not been found on revenue or railway stamps of Queensland to date. This device with its single head and thick pins may not have proved successful as the company chose to replace it with the TBS.a device in about 1911. 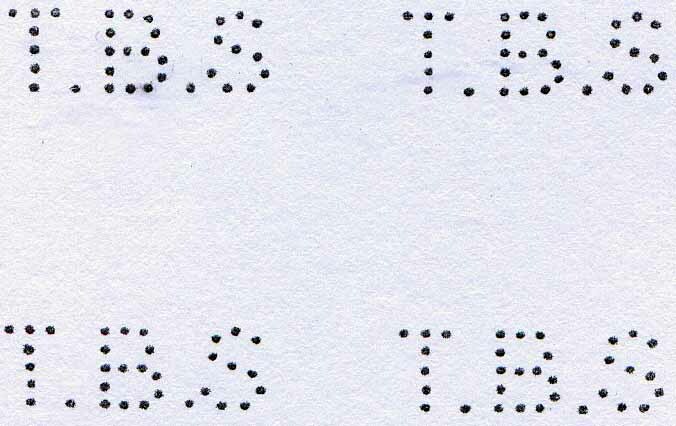 The TBS.a device was a 4 head device in a 2 x 2 format that was manufactured by Slopers in England and the device was located in Brisbane office. The pattern is smaller in scale than the earlier TBS and has finer pins. Its 4 head layout would have been most suitable for producing strikes in positions 2, 4, 6 and 8 in the contemporary issues of Queensland. Die I the top of the B is curved downwards in particular the 3rd pin is much lower than in the other dies. Die II the centre (2nd) pin at the top of the B is higher than the pins on either side of it giving it a rounded appearance. Die III has a flattened top to the B. Die IV this also has a flattened top to the B but the back of the curves inwards slightly where as in Die III it is straight. 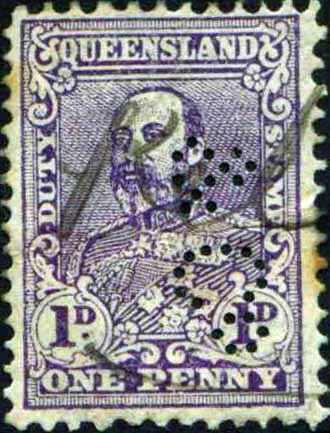 The pattern is found on revenue, railway and postage stamps of Queensland from as early as 1911 and later on postage stamps of Australia. Usage continues until at least 1956. *Australian Dictionary of Biography, Volume 7, Melbourne University Press. 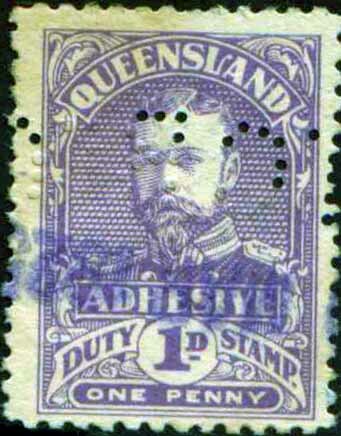 1915 issue 1d (South Brisbane). 1927 numeral issue 5d, 6d (Brisbane). 1927 numeral issue 5d R4, 6d R4. Device: This is a Brisbane device of a single head format that seems to have been used in the same office as the TBS.a device. In fact we have sighted an example on a postage stamp that carries strikes of both devices, albeit this strike dates from 1955. 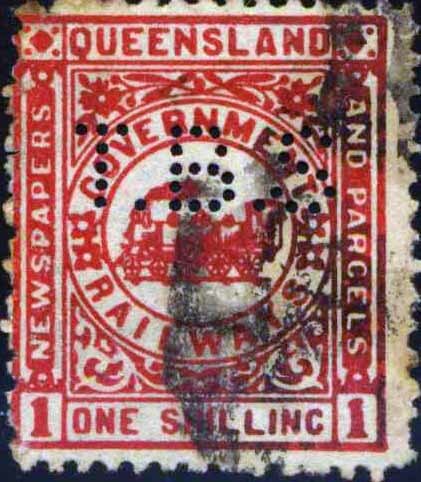 The pattern is found on railway and postage stamps of Queensland as well as postage stamps of Australia. 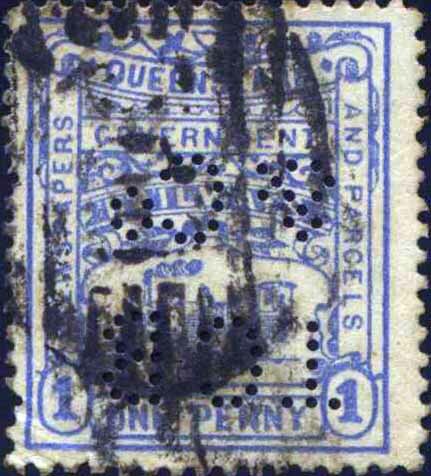 It has not been reported on revenue stamps of Queensland. The pattern made from this device shares many characteristics with the TBS pattern which predated the TBS.a device. It is possible that this TBS.b device is in fact a modification or repair to the earlier TBS device. Usage on Railway stamps is from about 1915 until around 1930. Usage on postage stamps is rare and intermittent and we have sighted examples in 1912, 1923, and much later usage period in 1955. 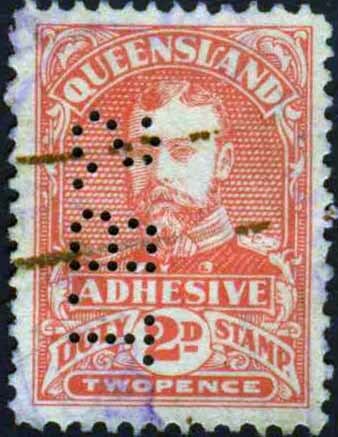 The pattern is characterised by thick pins and when applied to small stamps such as most of the postal issues of Queensland and the Kangaroo issues of Australia, it would have removed a great deal of paper and this would have weakened the stamps. This could explain the rarity of the pattern on these postal issues. 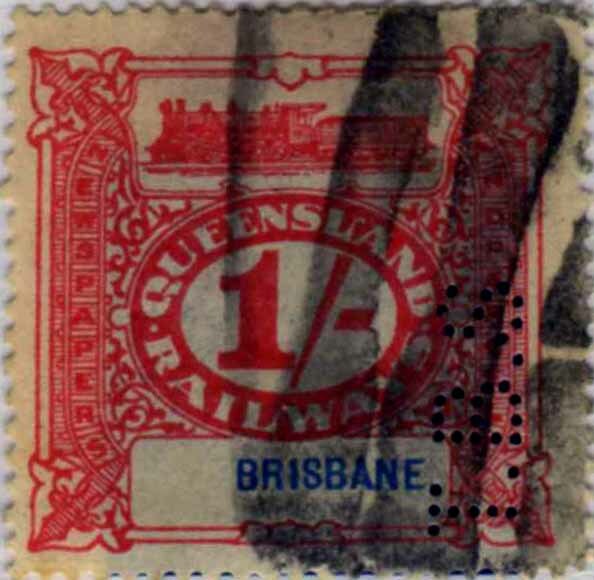 The device was more suited to the larger format Queensland railway stamps which because of their size are difficult to centre under the 4 head TBS.a device. 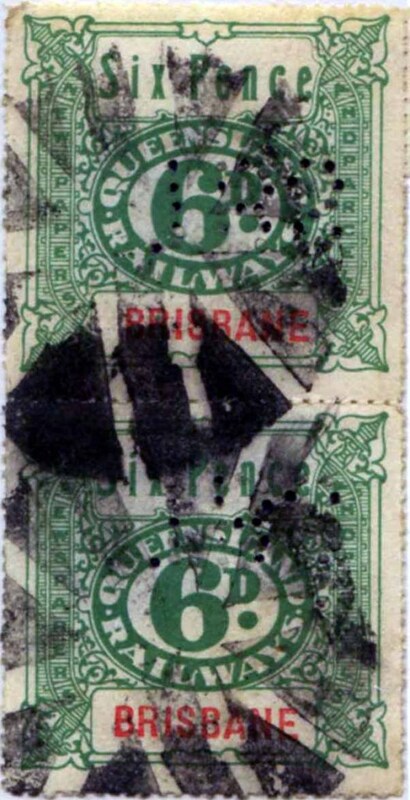 Therefore it is most likely that the TBS.b device was used specifically for puncturing the Queensland railway stamps and was only used on other issues infrequently, such as when the TBS.a device was out of service. 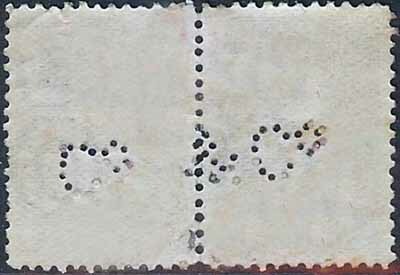 The strikes found on postage stamps in 1955 are of a poor quality but show a consistent missing pin in the S which supports the theory that it was a single head device. This late usage also corresponds to the end of the use of the TBS.a device and may have been a “stop gap” when the TBS.a device was discontinued, but it would appear that at this time the company chose to cease the use of perforators. 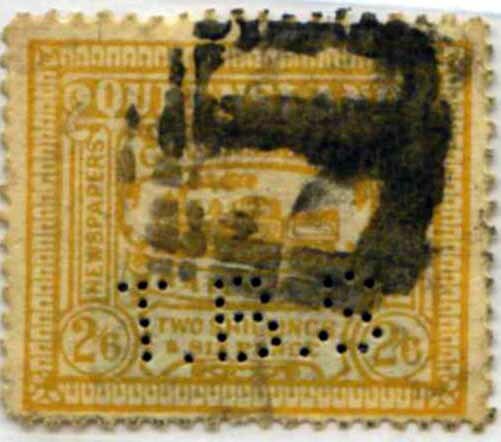 KEDVII 1908 issue 1d R3, 2d R4. KGV 1920 issue 1d R2, 2d R4. 1902 issue 1d, 3d, 6d, 1/-, 2/6d, 5/-. 1902 issue 1d R4, 1d (double pattern) R4, 3d R4, 6d R4, 1/- R4, 2/6d R4, 5/- R4..
Background: *Thomas C Beirne was born in Ireland in 1860. He was apprenticed as a draper and later in 1881 he joined M. D. Piggott of Tuam, County Galway, who befriended him and persuaded him to migrate to Australia. He travelled to Australia in 1884 and was initially employed in Melbourne by Eyre & Sheppard of Carlton, then by Foy and Gibsons. Piggott, who had also migrated, invited Beirne into a partnership in Brisbane, and in February 1886 Piggott & Beirne opened a drapery store in Stanley Street, South Brisbane, then a smart shopping area. The partnership was dissolved in 1891 and Beirne opened a new store in the then unfashionable Fortitude Valley; he was fortunate, for the great flood of 1893 destroyed South Brisbane as a retail centre. Beirne also instituted mail-order arrangements. In 1894 a Scot, James McWhirter became his manager for one year, then partner for three, eventually opening a rival store across the street. Beirne later said that this competition made the Valley the principal shopping area in Brisbane. He opened a branch at Ipswich in 1892 with his brother Michael as manager and another at Mackay in 1902. Beirne had managed well through the crash of the 1890’s and in 1905 he was invited to become a member of the Legislative Council a position he held until the abolition of the council in 1922. As a result of his success and influence Beirne was a welcome addition to many company boards including the Brisbane Tramway Co., the Queensland board of the Australian Mutual Provident Society, Queensland Trustees, the Atlas Assurance Co. and the British Australian Cotton Association. Beirne remained active in his store until shortly before his death 1949. Device: This was a Brisbane based device and it is found on the revenue, railway and postage stamps of Queensland as well as the postage stamps of Australia (from 1913) in the period from 1906 to at least 1930. 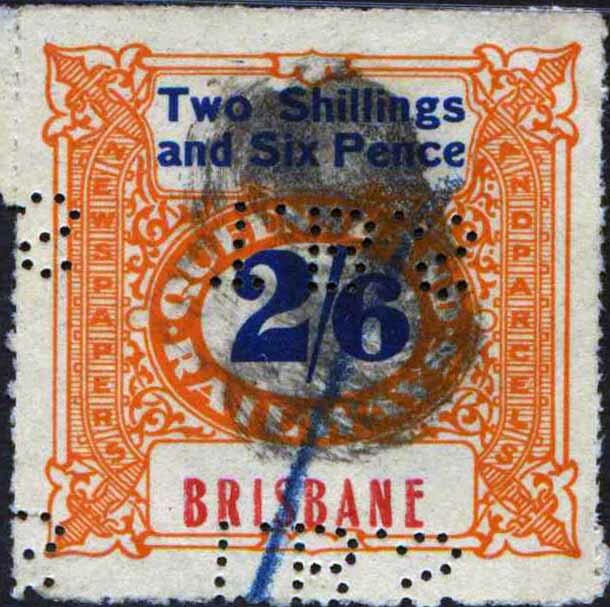 The pattern has also been reported on postage stamps of New South Wales but these carry Brisbane postmarks and are most likely just stocks of NSW stamps being used in Brisbane. This practice was common around 1912 as State Postal Authorities tried to use up stocks of stamps prior to the release of Australian Commonwealth issues in 1913. 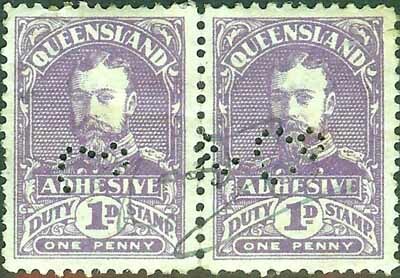 Queensland postal records show that in June 1911 the Company was asked why it was using perfined stamps without approval. The Company replied that they had approval but this could not be confirmed by the Post Office but approval for use of the perforator was given in July 1911. A further application was made in May 1931 and approved in June 1931. Unlike most private perfin devices the TCB&CO device was most likely a multi head one, of at least 2 heads in a horizontal array. The dies are very similar in appearance to each other but the easiest way to identify them is to look at the base of the B. Looking at the 3 pins that make up the base of the B, you will notice that sometimes the centre pin is lower than the pins on each side of it and in other strikes it forms a smooth upward curve. It is possible that there are more than 2 heads but if this is the case then the additional heads are very similar to these two dies. Also any additional heads would most likely be in a horizontal array as we have found consistent separation between horizontal strikes but we have not been able to find the same consistent relationship between vertical strikes which would be the case if the device was of 4 heads in a 2 x 2 format, or larger. 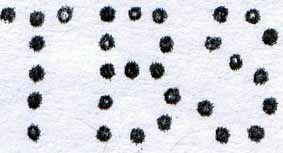 The pattern is often seen in partial form with blind pins and in some rare cases part letters missing. This could have been the result of inconsistent pressure being applied across the heads. These partial strikes coupled with the reasonably wide separation between the TCB of the first line and the &CO of the second line, may have lead to reports of the pattern TCB. All TCB’s we have seen show evidence of the balance of the entire strike, so the authors do not think a TCB device exists. In about 1930 and oddly, immediately prior to the device being discontinued, it was altered. This may have been associated with the May 1931 application to perforate stamps. Examples of these later dies are rare and are only found on postage stamps, in particular KGV issues with the small multiple watermark and the later perf. 13½x12½. These later dies can be identified by the base of the ampersand. Prior to alteration the two pins at the base of the ampersand were horizontal giving it a flat bottom. After the alteration the right hand pin in slightly higher giving the bottom of the ampersand an angled look. There are other difference in the shape of the C of TCB and the top of the T. It is possible that this later (1931) pattern was produced by a new device but similarities to the original TCB&CO device and its short usage suggest that it was more likely an unsuccessful refurbishment than a new device. Again 2 dies are identifiable and this supports the theory that the device is a multi head device with 2 heads in a horizontal array and it also supports the notion of a refurbishment rather than a new device.